RV-12 builders can ignore this post but those builders ever facing the need to rewire their air compressor motor from 110 volt to 220 volt service may want to read further. With the Holiday hustle and bustle is behind us, time was spent at the DOG Aviation’s hangar 45 improving the infrastructure. 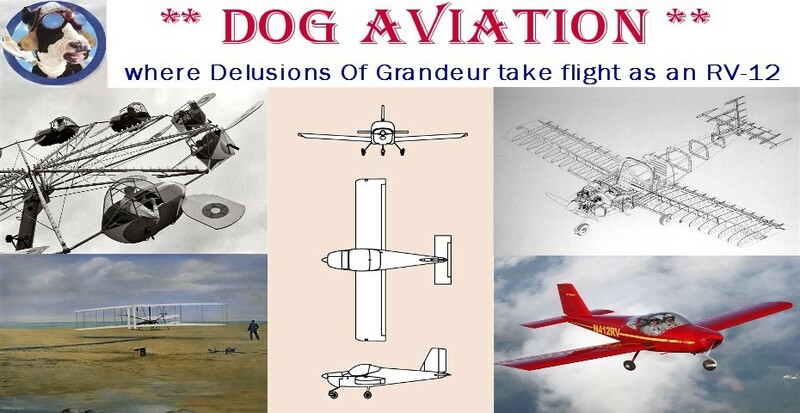 Frequent readers of the DOG Aviation Blog may recall it was discovered a few months ago that there was not enough 110 volt power available at the hangar to run the air compressor … which necessitated temporarily borrowing a gas generator to power the compressor. Now that the weather is getting cold and nasty, decided it was best to revisit the DOG Aviation hangar’s power issue so it will no longer be necessary to drag the gas generator outside when using the air tools … and there will be a lot of riveting in the coming months. There is a breaker box in the hangar for the folding door’s electric motor, so gave it a good perusal a while back and confirmed 220 volts is available there. One of the considerations when the air compressor was first purchased was making sure it had a motor that could be wired for either 110 volt or 220 volt service. So knowing the motor would work with 220 volt power, decided to order a 220 volt NEMA 6-15P power cord for the compressor’s motor. The plan was to tap into the 220 volt power inside the breaker box for the hangar’s folding door motor and route it through a conduit run to the air compressor. Mounting the outlet box onto the conduit and mounting plate. As a safety concern, to make sure the compressor CAN NOT be accidentally plugged into a 110 volt electrical receptacle, the air compressor’s 110 volt power cord NEEDS to be changed. I chose to use a NEMA 6-15P power cord and an appropriate NEMA 6-15R power receptacle. Wiring the receptacle is easy, there are only 3 wires … two hot wires and a ground wire. Finishing installation of the NEMA 6-15R power receptacle. A close look reveals the slots on the receptacle are horizontal as opposed to vertical as on a 110 volt receptacle. The wires were pulled into the breaker box that powers the hangar’s folding door motor and attached onto the terminals below the two fuses that can be seen in the photo below. The two power wires where added to the screw down terminals along with the existing wires that power the hangar’s door motor. The green ground wire was attached to a ground bus bar at the top of the box along with the other green ground wires for the door motor control. Pulling the three wires for the new 220 volt receptacle into the breaker box. The two hot wires (red and black) will attach to the terminals below each of the two fuses and the green ground wire will attach to the ground bus that can be seen at the top of the box where the other green wires are attached. Now that the power receptacle has 220 volts, the compressor motor requires a little surgery. The motor has a chart on the side that shows the wiring for low voltage and high voltage. Wiring chart on side of motor shows low voltage (110v) and high voltage (220v) wiring. There is a small cover plate on the side of the motor which covers a wiring block. In my case, only two wires (orange and brown) needed to be moved to different terminals to convert the motor from 110 volt to 220 volt power … being slip on terminals, moving the wires was easy. The original compressor motor wiring for 110 volt operation. The compressor motor’s wiring after being changed over for 220 volt operation. After the compressor motor’s internal wiring was changed for 220 volt operation, the existing 110 volt power cord was replaced with a NEMA 6-15P cord. This again was easy, but it was necessary to crimp connectors on the ends of the power cord’s wires before the cord could be installed. The power cord for an air compressor does not run directly to the motor it typically runs to a pressure switch which controls a contactor for the motor. My pressure switch cover only had one screw holding it on and was easily removed by lifting straight up. In my case, the white and black power cord wires connected to the line inputs on the top of the contactor and the lower wires go to the motor (and do not need to be touched). The power cord ground wire is attached onto the base of the pressure switch housing with a screw. Pressure switch with the cover off shows the power cord’s white and black wires going to the top of the contactor’s line terminals. The green ground wire attaches to the base of the pressure switch housing. Installing the new NEMA 6-15P power cord in the air compressor’s pressure switch. After the new power cord was installed and plugged into the new 220 volt receptacle it was time to turn on the switch and see if the compressor motor turns or burns. Much to my relief, the motor sprang to life! Success!!! The compressor runs great now!!! Thumbs up! The air compressor motor is turning and not burning. The motor is running great on its new NEMA 6-15 220 volt receptacle and power cord.